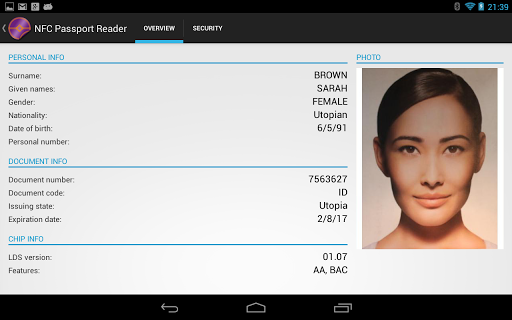 At Novay, as part of a project for EIT ICT Labs on Mobile Security & Privacy, we have been working hard on an Android app, based on JMRTD, to demonstrate how passports (and identity cards) and the passport holder can be validated. The first version of our efforts is now available from the Play Store. Now the underlying ePassport Java library JMRTD was ported to Android almost two years ago in a proof-of-concept app. The new Novay app focuses on two new features. First, it makes the passport reading experience as user friendly as possible. The UI is up to 4.x standards, and has been better thought out. We're looking at showing the information as soon as possible as it comes in over the (awfully slow) NFC connection, while at the same time making sure that the user understands that the document needs to held in proximity to the device for the couple of seconds that it takes to read all of the information. Second, and more importantly, the new app uses the security mechanisms of the chip embedded in a passport to their full potential. This means that the authenticity of the contents and of the chip are actually checked, and the results are displayed to the user. We're working on a next version this app in a second phase of this project. We still see plenty of possibilities to improve the usability. People at Novay involved are: Peter Ebben, Ruud Kosman, and myself. Thanks to Atlantic Zeiser for providing the sample document that was used in the screenshots above and in the Play Store. What authorization related use-cases could benefit from context information? Which context-sources are relevant, mature enough, secure enough to be used today (or in the very near future)? How to deal with the (lack of) quality and authenticity of context? Typical use-cases can be found in the area of the mobile workforce ("nomadic working", etc.). As organizations introduce these new ways of working, traditional security policies that are only based on (authenticated) identity and static roles and entitlements are too strict and too coarse-grained. 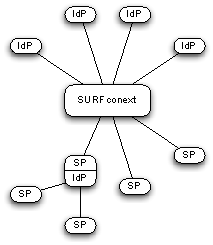 Context can make a difference here and allows finer-grained access so that, for example, medium level security tasks can be performed from home if the context allows this. A model for context-information can be constructed around different context-types, some traditional (location, time, ...), some more exotic (physiological, mental, social, ...). The above use-cases can already be adressed with the more traditional context-sources: location, time, proximity, device id, network id. These basic context-sources are readily available, and are under control of the organization. The easiest way to deal with authenticity and quality of context is to rely on trusted context-sources that are under control of the organization. Externalization of authorization, such as propagated by the Attribute Based Access Control (ABAC) paradigm (and facilitated by standards such as XACML) works well in practice when combined with context information. In a demonstrator (see video above) we showed that adding context to authorization policies managed by Tivoli Security Policy Manager (a XACML IBM product) comes down to adding a policy information point. Relying applications only need to understand XACML in order to become context-enabled. Obviously, there are questions left for future research. How to deal with privacy issues is one of them. Complexity of policies and other scalability and performance issues form another. Want to read more? Go check out the project page or read the white paper.